Listening here is an intentional act, an instance of focused attention directed toward an auditory object. What is heard is what sounds we take in--what we are or become aware of through varying degrees of attentiveness or inattentiveness? When we listen to something we tend to hear only what we're listening to; other sounds go largely or entirely unheard. What is heard can be the result of listening or can come to us contrary to our listening. In the latter case, an auditory object to which our attention is not (initially, explicitly) directed impinges on us while we're listening to something else. 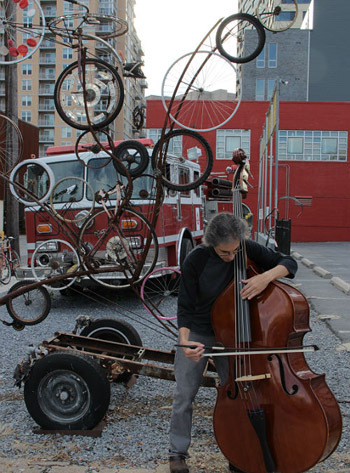 Consider the auditory object as an intended object--a musical performance or sound art creation. This is something, all else being equal, that is meant to be the focus of attention, that is, of listening. Ambient sounds--the audio background surrounding us--are sounds we more or less ignore. When listening they aren't heard--they fall below the threshold of attention (unless intrusive in some way). And yet they can be overheard--rising up to attention in spite of themselves, in spite of ourselves as listeners. The unintended audio object is a kind of contingency--an accidental presence to awareness. An eruption in sound. The intended audio object is, on the contrary, necessary. "Necessary" here is a relational term: necessary to someone, whether the listener or the composer and/or performer. Musical works as porous audio objects are defined by substantial passages of negative spaces (passages in which no deliberate sounds are produced). In them, intentional and accidental sounds are interwoven to the point where music and ambient sounds are mutually interpenetrating without necessarily prioritizing one over the other. Given the appropriate setting and intent, porous performance creates the preconditions for a coexistence of sounds without hierarchy. 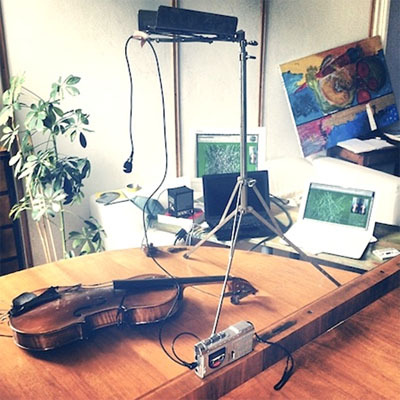 Between December 2013 and July 2014 Dutch sound artist Harold Schellinx (aka Har$) recorded String Quartet with windows, open, a twenty-four-hour long work for overlapping violin samples played back and recorded while his windows were open to the street sounds below. Divided into segments of twenty minutes each, the piece is a very long duration, porous work halfway between a sound construction and a field recording--a 72-part essay in counterpoint for four violins and a continuo of accidental ambient sounds. The core of the piece is Kris Kras, a grid of 1024 violin sounds Schellinx put together in summer 2013. The grid was created out of samples of a violin playing forty-one tones, each played with a different bowing or pizzicato, and with or without vibrato for a total of six different modes of sound production adding up to 246 individual tones. The tones were run through a program that generated two random orderings to be played back simultaneously, a virtual duet giving rise to chance harmonies, dissonances, solos and silences. Schellinx seems to have conceived SQWWO serendipitously. While working on another piece, he was playing back two iterations of Kris Kras--making for a virtual violin quartet--with the windows open. He was struck by what he describes as the "formal similarity between the two sounding layers" of the recorded violins and the ambient noise outside. To listen to SQWWO is to hear the eruption of the contingent. There are sounds of traffic and machinery, a hum of the white noise of general busyness out of which individual voices and identifiable sounds occasionally make themselves known: a horn, a motorbike, a siren, a lull in which the violins play through undisturbed. These sounds are the products of the specific site from which they originated--the D120 roadway outside of Schellinx's window--and of the accidents of atmospheric conditions and the ebb and flow of human activity as determined by the clock and calendar. SQWWO is exemplary of the way a porous work can bring unlistened-to sounds to a listener's attention. What ordinarily would impinge on us contrary to our listening--the background or ambient noises we would ignore while listening to a piece of music--here becomes an integral part of the music if not, as at times happens with SQWWO, the entirety of it. At that point hearing--the influx of sounds we don't necessarily intend to hear--becomes identified with listening, which is directed toward the sounds we do intend to hear. To this extent SQWWO shows listening to be a porous activity in itself, much in the same way that Kris Kras played before an open window is a porous work. The boundaries of both are permeable. With its indiscriminate mixture of music and environmental sounds, SQWWO reorders, reverses and eventually collapses the relationship between hearing and listing in a random way, similar to the way the violin samples are randomly ordered, or the way the violin sounds are randomly counterpointed by unpredictably arising ambient sounds. Overhearing becomes hearing, which final becomes listening. Thus SQWWO is something of an audio Necker cube (optical illusion) in that the relationship it facilitates between listening and overhearing is inherently unstable. The hierarchy of field and figure cannot hold as background sounds move to the foreground and vice versa; one minute we're listening to the violin quartet, and the next minute we're overhearing it as our attention shifts to the sounds outside. The relationship is unstable because it balances on a paradox SQWWO deliberately sets up: The paradox of taking unintended, contingent sounds and intending that they become the necessary object of the listener's attention.